This case study is on Email marketing and utilizing the popularity of Hollywood movies. I used the popularity of a popular movie franchise to create a website which gets close to 4,000 visitors a month and this is all free traffic. A popular movie trilogy called the Bourne Identity, Supremacy & Ultimatum came out a few years back. One of the most popular aspects of the movies was the fact that the main character Jason Bourne fought so well. He introduced a fight style into the movies that had never been seen before and revolutionized movie fight scenes since. In fact the Bond movies which featured Daniel Craig also implemented them in order to keep up with the popularity of the Bourne franchise. 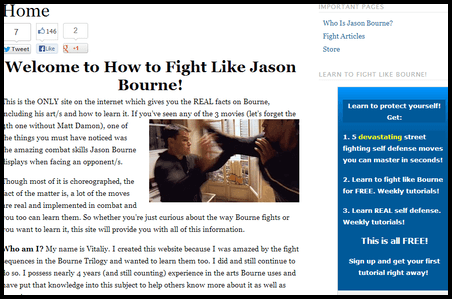 However, no body really knew what the fight style of Bourne was and flocked to the internet to find it, yet there only existed massive speculation and no clear answers. I had a perfect niche idea in mind! 1. I collect an email list from that website to anyone who signs up and give them a training guide. Being that I possess knowledge in the field of the art, I am able to share this information with visitors. 2. The purpose of collecting the email list is to: Help people first and foremost and promote a DVD series to them. 3. I also provide a store where people can buy martial arts supplies. Everything from gloves to DVDs related to martial arts practice. 4. I can also sell advertising space to schools/programs which wish to promote their product on my site. I can charge them $100s a month for this. I am contemplating this, but I’ve had offers before. 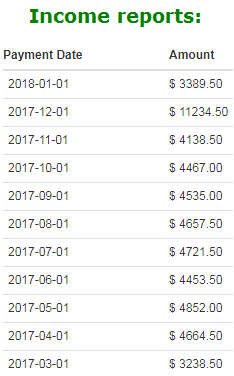 The point is this site can easily make $100’s every single month. In addition promoting a DVD series to 1000’s of subscribers (I’ve got over 1,000 a this point) can easily yield $100’s in profit on a daily basis. But this is ONLY because I earn trust in my subscribers which is what the MAIN goal of the website is: To help them! New products, movies, commercials and advertisements are constantly coming out, whether on television of the internet. Either way you can utilize their popularity to make money online, honestly. This is not something that will always work, but it offers TREMENDOUS potential. If you are considering using this type of method for your websites and you do not have prior knowledge in internet marketing, I would HIGHLY recommend you first get proper guidance. Here is the ONLY place I recommend getting that from. It’s free to join them and I owe all my knowledge that I gained to them. Next Case Study: How 1 Website Made Me $1,000’s All With Free Traffic. I remember reading this blog about a week ago. I was searching for online jobs and scams when I ended up in here. I’m giving it a try now and I’m loving it. Is my first week and I have learned so much I feel like I’m enrolled in college or something. Well, without the stress and the loans lol. Is rather fun and exciting. I can’t wait to finish my first website and earn revenues. Thanks Vitaliy for all your help and support. Hi Vitality, first of all this blog/website is incredible and really shows your comprehensive knowledge in the field of online marketing. In the case study above you mention that you promoted a DVD series to your email subscribers. Where did the DVD series come from? Was it possibly associated with drop shipping? Or was it something completely different? Also how did you make the store? I am assuming that most of the money made from this website was through purchases of items and I would love to hear your responses to the questions above (sorry if there are too many). Thank you for taking the time to read my message. Hey Ryan, I simply became an Amazon affiliate and found all of the products (including the DVD series) there. I didn’t exactly set up a shop, but I did make individual pages for each product and why I recommended it. On each of these pages, every product linked to an Amazon page which if people purchased through, I’d make a commission. In one of my emails, I’ll tell people about boxing drills and then say “You can get boxing gloves in any sports store or here”. The here will link to the boxing page I set up.